Discounts and promotions are a big part of E-Commerce transactions. 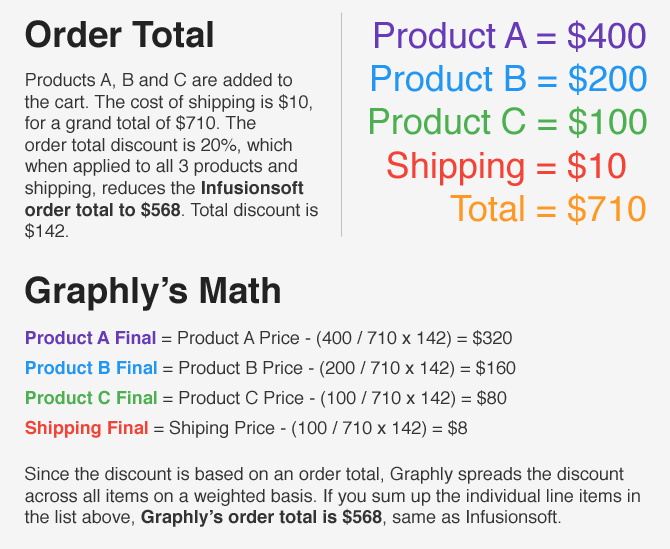 This article will help you understand how Infusionsoft handles shipping discounts, and how Graphly reports on invoices that include discount line items. Shipping discounts are just that. They only discount the shipping cost of an order. It applies a percentage or fixed dollar discount to the shipping total. That means individual invoice items (products) are not impacted by this type of discount. Nothing to worry about with this one. Order total discounts deduct a percentage of the purchase total (e.g. 20% off) or a fixed dollar amount (e.g. $10.00 off). The order total discount is applied to the total price of all of the products being purchased, including taxes and shipping. The Product Specific discount is applied to the price of a specific product. It can be applied as a percentage or fixed dollar amount. By default, a customer is eligible for a Product Specific discount as long as the sale product is in the shopping cart and any other criteria are met. A category discount is applied to an entire product category or combination of categories. It applies a percentage discount to the total price of the eligible products in the shopping cart and order form, when specific criteria are met. 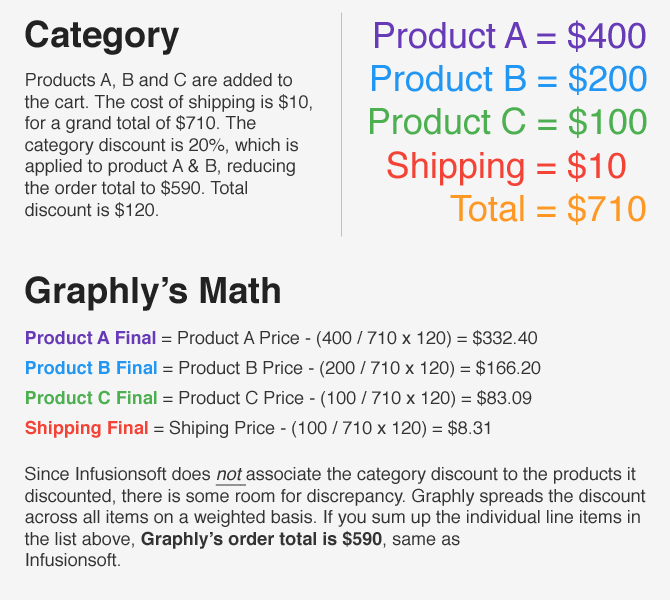 IMPORTANT: While Infusionsoft uses an order total, specific product or category to calculate the discount total, that discount total is a single line item on the invoice not tied to a specific product or category. Now that you have a basis for what Infusionsoft is doing, let's cover how Graphly reports on the data. We'll use the same scenario and product price points across the 4 unique scenarios to illustrate the differences among them. Pay attention to how each discount impacts the individual dollar amounts that will be returned in the reporting widgets. 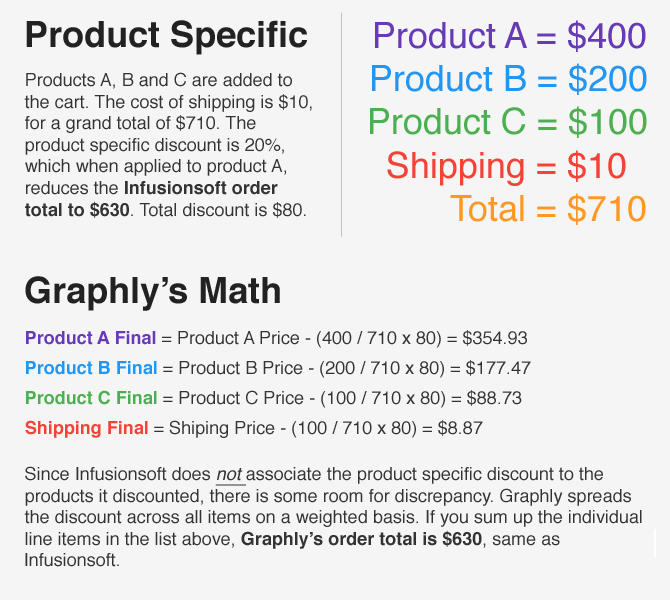 SUMMARY: On order total discounts, product specific discounts and category discounts, Graphly applies a weighted discount to each item based on it's percent of the order total. FINAL NOTE: For customers who use order total discounts and sell only one product at a time, the discount will apply to just the one product and to the shipping and tax items, making numbers even more accurate.